Are you aware that you’re up against hundreds of other supremely qualified candidates – and only a few will be chosen? The consulting resume/CV and cover letter are mysterious – and interview offers are scarce. What does it take to get the magical “yes”? 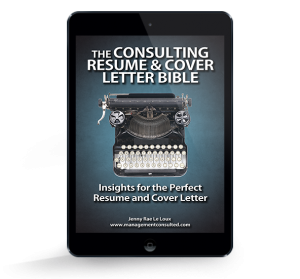 Even if your career office takes a quick read over your documents, or a friend at a consulting firm gives a 5-minute review, how do you methodically create the optimal resume/cover letter specifically for consulting? After all, you only have one chance – if you’re not successful, you’re locked out of re-applying for a minimum of 18 months. Don’t waste this opportunity! The guide provides specific tips on what reviewers at MULTIPLE FIRMS are looking for, explains HOW they review and offers step-by-steps to create consulting applications that convey exactly what reviewers want. 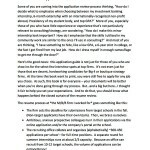 Typical cover letter rules don’t apply in the consulting industry. Be prepared to gain insider knowledge on how firms use cover letters, as well as the proper style and structure of your cover letter. Time to put all your hard work into action. We provide tips and valuable information on how and when to submit your application, secrets of online application systems and on-campus review processes, and steps to ensure you get the coveted interview. We provide an extensive list of over 100 firms looking for consultants like you – the abbreviated version of our Networking Bible Contacts Database. 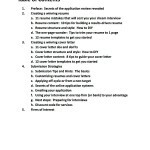 Includes 24 killer Resume/CV and Cover Letter templates. I used your material I bought online and clinched a job offer with McKinsey Japan Office, BTO Practice. Thank you! 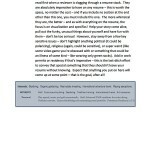 I found the fit interview material especially helpful, especially the challenge stories and success stories portion." As you can see from my previous purchases, I've been love your site and resources which I have been using for the last few months. I started off with your Consulting Interview Bible, and it was an excellent preparation for my interviews with the Big 3. I overhauled my CV and prepared a cover letter according to your advice, and managed to get a number of interviews. I followed your interview preparation advice and was lucky enough to get an offer from BCG in my home town (after many nervous moments! ), which I accepted with both relief and delight. I couldn't have done it without your resources - many thanks! "I scoured the Internet for good resume resources and stumbled on yours. I had done a lot of work on my resume, and even hired so-called experts to help me. I was really skeptical when making my purchase, but I’m so glad I did! Buying your Consulting Resume and Cover Letter Bible was the best decision I made in my whole job search. The templates were especially incredible…I was really battling to come up with a super-professional format and mixing and matching them gave me a resume my friends all want to copy! Thanks for taking the time to create this resource — you’re really making a difference!" “I scoured the Internet for good resume resources and stumbled on yours. I had done a lot of work on my resume, and even hired so-called experts to help me. I was really skeptical when making my purchase, but I’m so glad I did! Buying your Consulting Resume and Cover Letter Bible was the best decision I made in my whole job search. The templates were especially incredible…I was really battling to come up with a super-professional format and mixing and matching them gave me a resume my friends all want to copy! Thanks for taking the time to create this resource — you’re really making a difference! 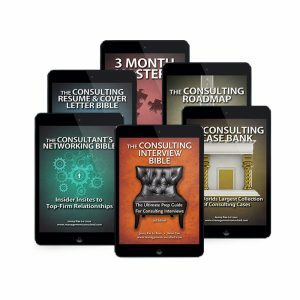 I purchased the Management Consulted Book Bundle and it has by far been the clearest and most informative collection of instructions on the whole ‘getting into consulting’ process. Thanks so much for all the great work you guys are doing! I'm an experienced professional. Is this guide just for undergrads or MBAs? Absolutely not – this guide is for you too. Why? Because your transition is harder, your explanations more nuanced, your experience more robust (read: lengthy) and therefore you need more help. We work with folks just like you every day on our resume/cover letter editing side, so we’ve crafted the book to address needs both of current students and current professionals. How is the book delivered? I need it right away. Good news! The book is an electronic download – just add it to your cart, create an account during the checkout process, and your book will be available immediately after purchase. You can get started on the creation of an awesome resume and cover letter – right away! I'm not from the U.S. Is this guide still relevant? Yes, absolutely! The application processes for consulting are nearly identical globally. When the requirements differ slightly between the U.S. and overseas for other firms, this book was written to address even these topics — covering cross-border issues throughout (pg. 35 is just one example). Approximately 40% of our customers are applying to overseas offices, so we share our international perspective. Of course, feel free to check in with a local recruiter on things like page length and mandatory content for each region so you have up-to-the-minute intelligence – but we have successfully advised clients in the U.S., Canada, Latin America, the U.K., Europe, MENA, Sub-Saharan Africa, Russia, India, SE Asia, China, Australia/New Zealand, etc. That’s right – we cover the globe, and in the process consistently get rave reviews on both this book and the premium editing services we offer. Can I buy the book in print? No. Why? Our customers have confirmed that this is the way to go. You can start creating a brand new resume/cover letter in less than 5 minutes! 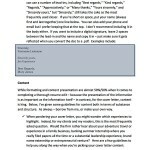 It would be great to have a print version — but the speed and flexibility of the online version is superior, and of course we couldn’t deliver 24 useful templates to you in a printed book. I'm not even applying to consulting firms. Is this book going to help me at all? Unless you’re specifically applying to jobs with the U.S. Federal government, which has its own wonky standards on how to present your information, this book will give you a best practice resume for business roles – period. Reason #1 why this is important: if it’s good enough for top-tier consulting, which is one of the most competitive fields globally to break into, it’s good enough for any application. Reason #2 why this is important: our clients don’t have time to create multiple resumes, so we help build a resume that’s awesome for any kind of job. Yes, that includes i-banking, finance, legal, accounting, corporate strategy, and thousands of other roles you might be thinking about. We even work with a growing number of MBA applicants every year to create the perfect B-school application resume. Of course, you might have to change a few keywords for very specific roles, but 99% of the resume will stay the same regardless of the role you are applying for. I need more help. Will you still edit my documents? You bet. Sure, 90%+ of you are going to find that this book makes your life a breeze, and for a fraction of the cost, you’ll get the best resume around. However, for the rest of you — breaking in from drastically different fields, applying cross-culturally, or in need of a second eye to make sure your English is perfect — we work around the clock with our hand-selected team of ex-MBB consultants on premium resume/cover letter editing services, recreating your documents and advising you personally along the way. If you wish, try the book first, but if you want our expert help, upgrade to Consulting Job Hunt ($475), Consulting Jet Pack ($975) or Black Belt Deluxe ($1975) within 30 days and you’ll get a refund of your $95 book purchase. Is there a refund policy for the Consulting Resume and Cover Letter Bible?